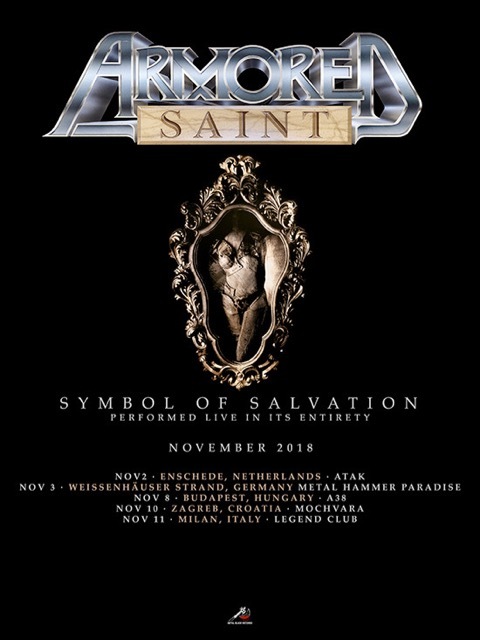 In November, ARMORED SAINT will embark on a European tour commemorating the band’s classic “Symbol Of Salvation” album. On this special run, the group will perform “Symbol Of Salvation” in its entirety. Bush previously said that “Symbol Of Salvation” was “arguably ARMORED SAINT‘s most important record. These songs came out of us being dropped from Chrysalis Records and finding out about guitarist Dave Prichard developing leukemia. The songs took on a much more emotional meaning than any other previous record. We wrote songs of desperation like ‘Another Day’ and ‘Last Train Home’. Experimental tunes like ‘Tainted Past’ and ‘The Truth Always Hurts’. Classic SAINT rockers like ‘Reign of Fire’, ‘Dropping Like Flies’ and the title track. “After Dave passed, the band regrouped with Phil and Jeff returning as the guitar tandem. It was a family again. Dave Jerden produced the record and this marked the beginning of Joey becoming the producer of the band. To further celebrate the legacy of this album, Metal Blade Records will reissue “Symbol Of Salvation” on CD and LP on May 18. The LP will feature a vinyl remastering from Patrick W. Engel as part of the “Metal Blade Originals” series. Special treatment and 400g heavy cardboard spine sleeves (inside out print), 60x60cm two-sided artwork posters and 250g inserts guaranteed! The CD will include four bonus tracks.